More and more colleges are offering full and partial distance learning for everything from engineering to mental health professions and beyond. Completely virtual college and universities, as well as trade schools and technical schools are now popping up offering affordable degree, certification, and licensing programs at your own pace. But what does this mean for your degree if you can earn it without ever setting foot on a college campus? First, it’s important to understand that not every online school is legitimate. The same holds true for in-person programs. If a virtual school or program is not accredited by an accrediting agency recognized by the US Department or Education, any credentials you earn from it will be for naught. That doesn’t mean you won’t learn valuable information from quality course content, but to an employer or further advanced education program admissions office, your education won’t matter. 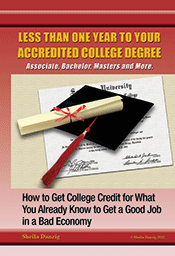 If you are looking into distance learning programs, make sure you enroll in an accredited program. Check to make sure the school is accredited, then check to make sure the agency is legitimate and recognized. You can do this by working backwards from the school’s website, to the agency’s website, to the US Department of Education’s website. You can also consult with us at TheCareerPeople. If you have already completed courses with an unaccredited online school, it may not be too late to salvage your education. Talk with us at TheCareerPeople to learn more.